I would like to introduce myself as - S. SELVA KUMAR, A staunch MGR Devotee and an Admirer of his movies, since 1968 when I was only 12 years of age. Because of him, I have come up in my life and attained the current status of Professor, in the Society. As he was considered as ‘VATHIYIAAR’, the interest towards Teaching had arisen within me, to guide the students in a right direction, resulted in leaving my Public Sector undertaking job, after 26 years of valuable service. His stressing the need for Righteousness, Justice, and Affection towards Parents, Respect to the Elders and to do Good things for the development of Community, Rendering possible assistance to others, through his films really attracted me like Magnet. I consider him as God in view of his laudable hard efforts made for the upliftment of down-trodden people, when he was film personality and also a charismatic Chief Minister. Not only the People of Tamil Nadu but the Tamilians wherever live in the World, always remember him and express their gratitude for his implementation of people oriented Schemes that derived benefits for the needy. He is the one, incomparable with other Leaders by virtue of his protecting the interest of Tamilians and Tamil Nadu. 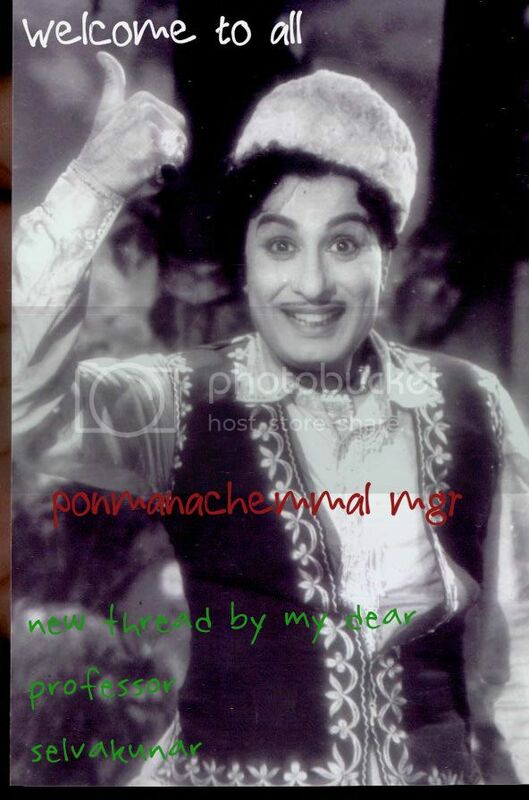 I request the Thread users to post the comments related to our Ponmanachemmal MGR only. I also request that posting the Comments, should not in any way hurt the feelings of others, as we are all aware that our M.G.R. is an incomparable human being with anybody else. That is why people still remember him even after his death of 25 years elapsed. To go in deep, many worship him as God. I seek the co-operation and support from all concerned and welcome the comments. Last edited by makkal thilagam mgr; 21st January 2013 at 03:15 PM. I am happy to present the details of each film in a desired manner. Last edited by makkal thilagam mgr; 21st January 2013 at 03:17 PM. பொன்மனச்செம்மல் MGR FILIMOGRAPHY NEWS AND EVENTS என்ற தலைப்பில் துவங்கியுள்ளது மிகவும் மகிழ்ச்சியான செய்தியாகும் . மக்கள் திலகம் நடித்த 134 படங்களின் முழு விவரங்களோடு எல்லா தகவல்களையும் இங்கு நாம் கருத்துக்களை பதிவு செய்யலாம் . இந்த திரி துவங்க முழு ஆதரவு தந்த திரு ராகவேந்திரன் அவர்களுக்கு நன்றி . Last edited by esvee; 21st January 2013 at 03:24 PM. பொன்மனத்தலைவனுக்கு புகழ் சேர்க்கும் விதத்தில் புதிய திரியை உருவாக்கி புரட்சித்தலைவரின் ரசிகர்களை மகிழ்ச்சிகடலில் மிதக்கிவிட்ட திரு. செல்வகுமார் அவர்களுக்கும், நமது தெய்வத்தின் பக்தர்களான திரு. வினோத் அவர்களுக்கும், ராமமூர்த்தி அவர்களுக்கும், திருப்பூர் ரவிச்சந்திரன், சைலேஷ் பாபு, சிவகுமார், ஜெய்சங்கர் அவர்களுக்கும் நன்றி..
Great Work Professor Selvakumar Sir. I will try to provide as much information I hold to this thread. Sathi Leelavathi the first movie that our beloved Leader Puratchi Thalaivar had appeared. First he was chosen for the role of a detective the character comes along with the whole movie. But unfortunately he was given Inspector Rangaiah Naidu. As per the information our MGR role is very small and that his scenes lasted not more than 6 minutes. Last edited by MGR Roop; 21st January 2013 at 05:30 PM. 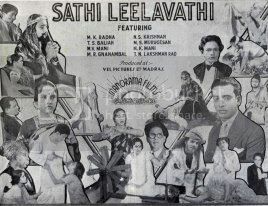 The above image is the advertisement of Sathi Leelavathi taken from internet. Here is another ad which is in colour and fortunate for us we can see the back side of MGR, sitting right to the lawyer. Sathi Leelavathi (lit. Leelavathi the wife) was based on a Tamil play named Pathi Bhakthi (lit. Devotion to the Husband) written by A. Krishnaswami Pavalar and starring K. P. Kesavan. It was staged by the Madurai Original Boys Company. 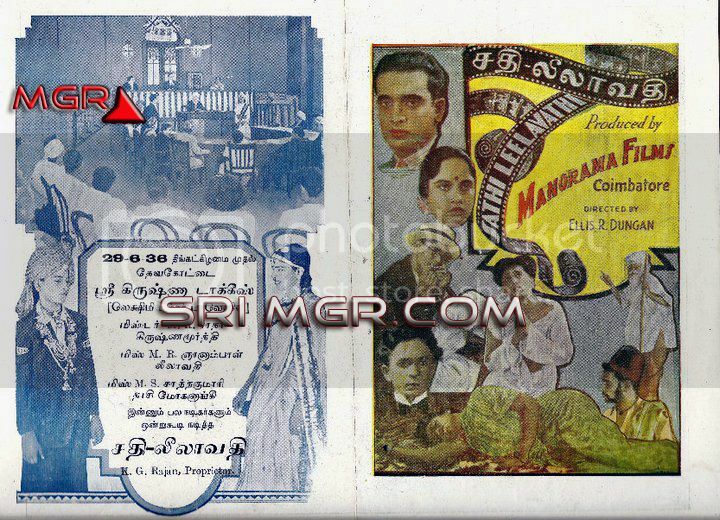 M. Kandasamy Mudaliar wanted to make a film based on the play. Production started but soon stalled due to differences and K. P. Kesavan canceled his contract. Mudaliar walked out of the production and started a new film titled Sathi leelavathi based on a novel written by S. S. Vasan and serialized in Ananda Vikatan. 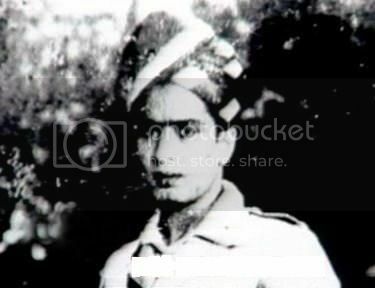 Mudaliar's son M. K. Radha was cast as hero and an unknown (then) 19 year old M. G. Ramachandran was cast as Police Inspector Rangayya Naidu. The film was produced by Marudachalam Chettiar of Coimbatore. Chettiar wanted Manik Lal Tandon to direct the movie and went to Calcutta to hire him. Tandon who was busy directing Nandanar, introduced Chettiar to Dungan and recommended Dungan be given the chance instead. Dungan was hired as director and the film was made. Some scenes were shot in location at Ceylon. The completed film was 18,000 feet in length. Sathi Leelavathi dealt with the evils of alcoholism and promoted prohibition. It also depicted the plight of plantation workers in Ceylon. It is the story of a young man who becomes an alcoholic and runs away to Ceylon and the difficulties he faces there. Our beloved Leader from Sathi Leelavathi.